The Wells High School "W" logo, with a feather, is seen on the center of the basketball court during a girls basketball game. 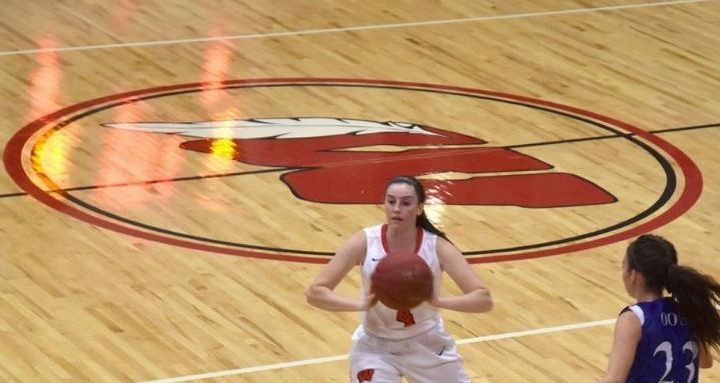 A committee reviewing Wells High School’s use of the sports team name Warriors and related Native American imagery in its logos will reportedly recommend the school drop the imagery, but keep the name. The Wells-Ogunquit Consolidated School District announced that the school board’s advisory committee looking into the issue voted by secret ballot Wednesday night on the recommendation, according to the Portland Press Herald. The district’s school board will make the final decision on the subject at a later date. A majority of the 26 panel members — 17 — voted to discontinue use of Native American imagery, but keep the Warriors sports team name, the newspaper reported. While smaller numbers of committee members reportedly voted for alternative proposals — such as to continue using a logo including the letter “W” and a feather, but not one featuring a Native American’s head — none voted to stop using both the imagery and the team name. Portland attorney Sigmund Schutz, who represents the Press Herald, told the newspaper the secret ballot nature of the committee’s vote violated the state’s Freedom of Access Act. But the school district argued that since the panel has no decision-making authority and is simply making a recommendation to the larger school board, it’s exempt from Maine’s Open Meeting Law.